Jack and Terrie Chapman are celebrating 50 years of marriage. The children of Jack Milton and Theresa Lorraine Chapman happily announce their parents 50th wedding anniversary. Jack and Terrie were married on Aug. 17th, 1968 in Dayton, Ohio. They have always mentioned that it was 100 degrees that day and the church was not air conditioned. They were high school sweethearts at Stebbins High School in Dayton, where Jack graduated in 1966 and Terrie in 1968. They married while Jack was attending college at The University of Dayton. He graduated with a music education degree in 1970. Jack and Terrie were blessed with two daughters, Trina Marie in December of 1970 and Melissa Lynn in March of 1972. Each daughter married and blessed Jack and Terrie with a total of six wonderful grandchildren. Trina had Jordan, Jennica, and Jessalyn Rife. Melissa had Ethan, Aria, and Laurel Marting. 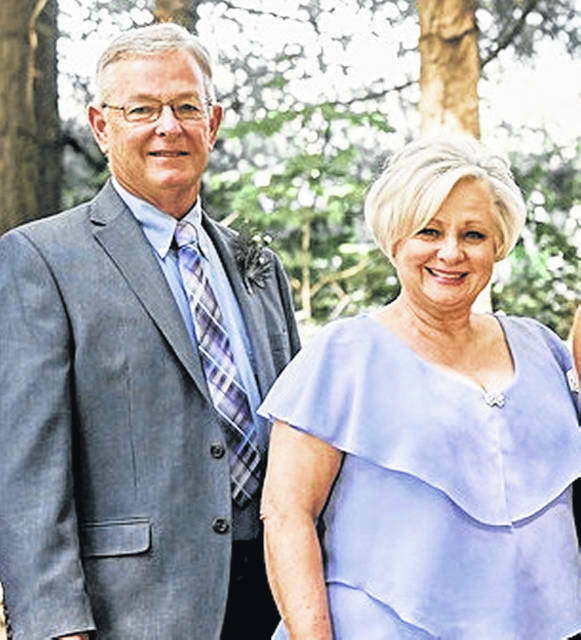 The Chapmans lived and raised the girls in Dayton until they moved to Fayette County in the summer of 1980 for Jack to begin his new job as the assistant band director at Miami Trace High School. Mr. Chapman worked many interesting second jobs throughout his life in addition to his full-time career as an educator. He was an excellent provider for his family and an even better father to his girls. While in Fayette County, Jack was a band director at Miami Trace High School, a third grade teacher at Chaffin Elementary, and an intervention teacher at Miami Trace Junior High in Bloomingburg, working for Great Oaks. He enjoyed many years of coaching Miami Trace Jr High track and MTJH girls’ basketball. Jack retired from teaching in 2008. He continues to raise chickens and rabbits, help the grandkids with 4-H, and is an avid gardener. “Miss Terrie” opened Terrie’s Dance Spectrum in Jeffersonville in the fall of 1980 and started teaching kids the art of dance and acrobat at The Lion’s Club building. As the dance business grew, Terrie moved her studio to Washington Court House. She continues to run her studio and teach classes. While both girls have been involved over the years, Melissa continues to teach at the studio. Terrie holds a yearly recital, which Jack has always supported and helped with. She absolutely adores her students and their parents. Please join Trina and Melissa in congratulating their parents on the accomplishment of 50 wedded years. We also thank them for showing their grandchildren what commitment and love should look like. https://www.recordherald.com/wp-content/uploads/sites/27/2018/08/web1_B8ED6FFC-41FE-4D9B-8A7D-B7F85BAA63BE-9939-00000DCC3AED75F9.jpgJack and Terrie Chapman are celebrating 50 years of marriage.